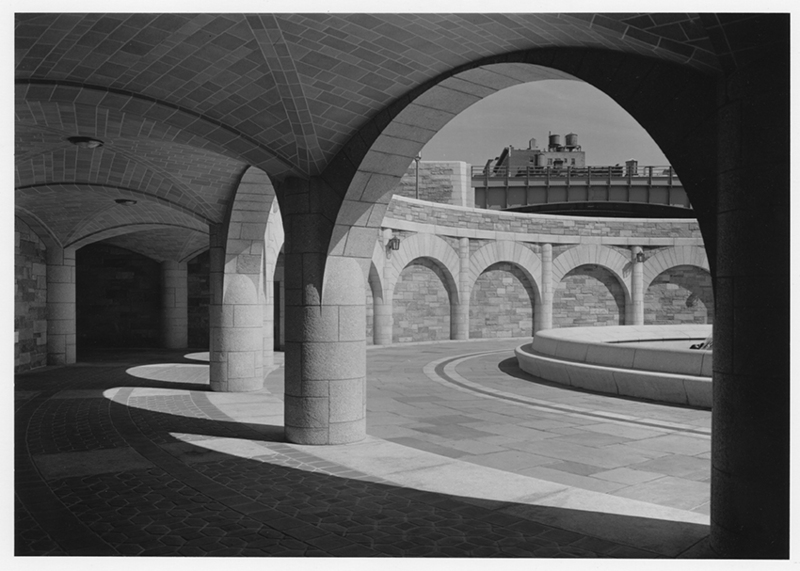 New York’s master builder, Robert Moses (b. 1888; d. 1981), will be the subject of concurrent exhibitions on view at the Queens Museum of Art (New York City Building, Flushing Meadows Corona Park), the Museum of the City of New York (1220 Fifth Avenue at 103rd Street), and the Miriam and Ira D. Wallach Art Gallery at Columbia University (8th floor, Schermerhorn Hall). Collectively titled Robert Moses and the Modern City, the exhibitions will document the ambitious projects that Robert Moses spearheaded and examine his legacy within the context of contemporary New York. Never-before-exhibited models (or many seen for the first time in decades), historic objects, plans, and vintage and new photography will be on view at the three venues to shed light on Moses’s vision and achievements. A highlight of Robert Moses and the Modern City, on view at all three venues, will be never-before-exhibited, large-scale color photographs (some especially commissioned for the exhibitions) by acclaimed photographer Andrew Moore, artist-in-residence at Dartmouth College. These monumental photographs will show how Moses projects have been absorbed into the fabric of the city. The exhibitions at each venue will focus on different aspects of Moses’s legendary career and achievements. A brief description of each follows. Robert Moses and the Modern City: The Road to Recreation, on view at the Queens Museum of Art from February 4 through May 27, 2007, will document Moses’s massive 1930s expansion of the public realm and its connection to a matchless network of parkways in anticipation of the new automobility. Moses envisioned, planned, and built Flushing Meadow Park (where the Queens Museum of Art is located), as well as the surrounding highways. Envisioning New York as a “water city,” Moses reclaimed the shorefront for recreation—Orchard Beach and Jacob Riis Park are crowning examples—built monumental, outdoor swimming pools that remain pinnacles of public architecture, and built parkways conceived as “ribbon parks” with extensive landscaping, stone-arched bridges, playgrounds, and bike paths. On view will be Andrew Moore photographs of Astoria Pool, Sunset Park Pool, and Orchard Beach, among others; a large-scale model (made by Moses and not exhibited since the 1960s) of the proposed bridge across Long Island Sound; vintage (1930s) films made by the Department of Parks showing huge crowds and integrated swimming at McCarren and Highbridge Pools; and more. A highlight of the exhibition at the Queens Museum of Art will be the reopening of the Panorama of the City of New York, the world’s largest architectural scale model, made by Moses for the 1964-65 World’s Fair. The historic piece, measuring almost 10,000 sq. ft. and depicting the city’s 895,000 structures, was closed during the fall and winter of 2006 while undergoing a complete multimedia and lighting upgrade. • Making New York City livable and desirable—a hometown—by improving parks, including the expansion of Riverside Park, East River Park, and the transformation of Central Park. On view will be Andrew Moore photographs of Riverside Park and the Cross Bronx Expressway, among others. A large-scale model (269” x 86”) designed by the I. M. Pei-based firm of Webb & Knapp, not seen since the 1950s, showing Moses’s proposal for the entire Midtown Expressway (presenting the route and surrounding area in remarkable detail) and never-before-exhibited archival materials related to Lincoln Center (drawn from its own archives, the Rockefeller Archives, and Columbia University) are among the highlights on view at the Museum of the City of New York. The exhibition will also address Moses’s defeats in the face of public protests and the rise of a new approach to urbanism based on neighborhood values and community control. The defeat of Moses’s projects to extend Fifth Avenue through Washington Square Park and to build the Lower Manhattan Expressway marked the end of the Moses era. Proposals for the Expressway will be on view. Robert Moses and the Modern City: Slum Clearance and the Superblock Solution, opening on January 30, 2007 at Columbia University’s Miriam and Ira D. Wallach Art Gallery will present for the first time the full scope of Moses’s 1950s urban renewal program, which became a national model. His strategy involved recapturing the middle class by building affordable housing and enhancing the city’s brainpower by providing land to universities for campus expansion (New York University, Fordham, the Juilliard School, Long Island University, and Pratt Institute). His program featured the biggest expansion of union-backed cooperatives in the city’s history—eight in all—including the East River Houses at Corlears Hook, Chatham Green, Chatham Towers, Penn Station South, and Morningside Gardens. Here, the exhibition will also spotlight I. M. Pei’s and William Zeckendorf’s roles in the urban renewal process; Pei designed Kips Bay Plaza and the NYU Silver Towers, and Zeckendorf built Kips Bay Plaza as well as Park West Village and Lincoln Towers. On view will be brochures from the Slum Clearance Committee that illustrated the redevelopment proposal, made the case for clearing a neighborhood, and explained how relocation would be handled; renderings of I.M. Pei’s renewal work in the early 1960s; and historic photographs and documents that show the process of site clearance and community protests against renewal. A publication, Robert Moses and the Modern City: The Transformation of New York (W.W. Norton), accompanies the exhibitions and will be available in the shops at each venue. It is co-edited by the exhibitions’ curator, Hilary Ballon, an architectural historian and professor of art history and archaeology at Columbia University, and Kenneth T. Jackson, Jacques Barzun Professor in History and the Social Sciences at Columbia University. Robert Moses and the Modern City: The Road to Recreation, is made possible with funding provided by the National Endowment for the Arts, the New York State Council on the Arts, Furthermore: a program of the J. M. Kaplan Fund, and the Graham Foundation for Advanced Studies in the Fine Arts.